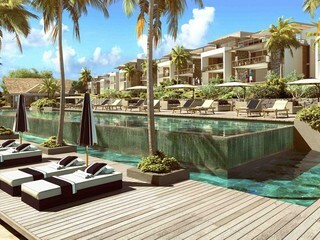 Sign-up and receive Property Email Alerts of Residential New Developments in Goodlands, North Mauritius. Located in the North of Mauritius, St. Antoine is a charming area embedded with Mauritian tradition and authentic country appeal. Only 10 short minutes from the hub of Grand Baie, there is easy access to everyday conveniences and comforts - private schools, shopping, restaurants and bars, the prolific Grand Baie nightlife, and all the nautical activities you could wish for. St. Antoine Private residence is all about discovery; an opportunity to explore the real Mauritius. Authentic in every sense of the word, it is a unique Mauritius that can easily become your second home. Comprising of 100 luxury apartments and penthouses as well as 30 plots of land, a lifestyle at St. Antoine Private residence will entice the smells, sights and sounds of this tropical paradise that extends on over 17 acres, encouraging you to rediscover the adventurous spirit that burns inside. With 2 and 3 bedroom options available, the residences depict modern, luxury living. Exuding both comfort and style, they have been designed to offer the perfect family or holiday home, and an ideal lock-up-and-go solution.